This album features Barry Morgan of Blue Mink on drums, following his appearance on Hot Hits 2. It also features Tina Charles singing "Stoney End", and curiously she also appeared on Hot Hits 2. Side 2 uncharacteristically includes three tracks which failed to crack the top 40: "Why"; "(Where Do I Begin) Love Story" and "Right Wheel, Left Hammer, Sham". This Australian edition is catalogue-numbered SMFP-8242. The front cover does not differ from the UK album. On the back, the layout is essentially the same as well, but has the Australian address details for MFP and a different logo. The label is again of the red oval design, yet to see light of day in the UK. Although this LP was seen on a Spanish website, we believe it to be from Greece since it was released by EMI on their Regal label, which Greece were using. (Spain were using their own MFP label at this point.) 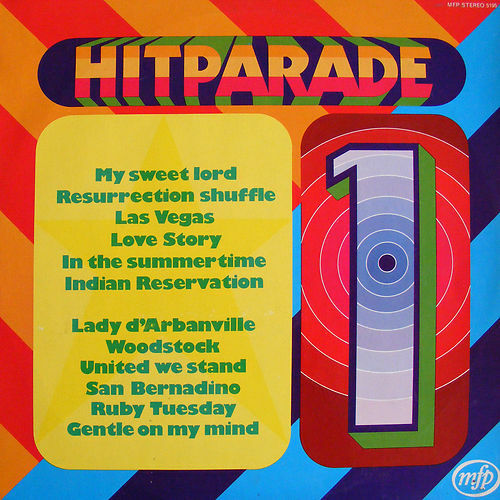 The cover carries both logos top-left - and of course no MFP logo - and the cover also has the phrase "Hit Parade" in English at the top. The album above is a Dutch release called "Dance Party", which was issued by mfp, catalogue number "MFP 5438". It is not thought that the contents are from the UK albums, and indeed only eight of the 28 titles appear in the main LP series. However we note a couple of coincidences with Volume 4: "My Sweet Lord" and "Rose Garden". There are also a couple of songs which match titles on Volume 5: "It Don't Come Easy" and "Mozart Symphony No. 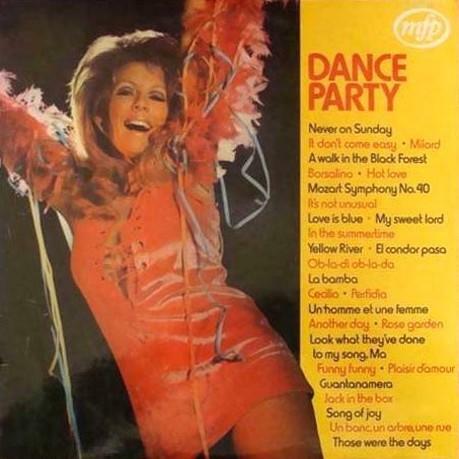 40", indicating that "Dance Party" was released later than "Hot Hits 4". The South African edition, left, differs little from the UK album. The catalogue number is the same, and the label is mfp. This West German LP was issued on mfp and appears to be a compilation from the UK albums. Since it would have come out around the same time as "Hot Hits 4" (from which the first four tracks are taken) we decided to place it here in the chronology.